Creating a new album is done by using the New Album Wizard. The wizard enables creating a basic album in 4 simple steps. To start the wizard, select 'New album' from the first screen displayed when you run the Album Maker. Moving from one step to the next is done by clicking on the button on the top of the wizard screen. Moving to the previous step of the wizard is done by clicking on the button. By moving with the mouse over the button a tool tip appears describing the selection you need to perform in the current step. Fill in the album name in the Album name field in the top. To select an album type first select the album group, then click on the album type you want to use. After you selected an album type you can see the album details and prices on the right side of the screen. You can also select specific cover for this album type. To select pictures for the album press the ‘local’ button , select the required folder on the left side on the screen, select the photos in the middle side of the screen and click on the button to move them to the 'Selected area' on the right side. You can select multiple photos by clicking the left mouse button on a photo and holding the Ctrl key at the same time, or by clicking on the first photo and then clicking on the last photo while holding down the Shift key. You can select all the photos in the folder by clicking on the ‘Select all’ button. 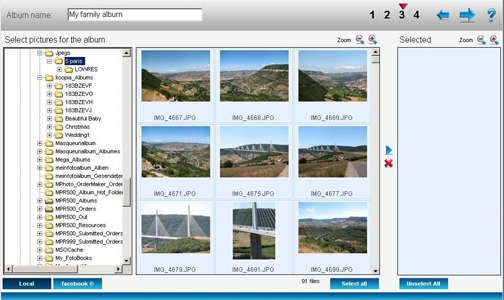 If you want to select photos from multiple folders you can select a different folder after moving the desired pictures to the selected area and repeat the move process; or you can add pictures later on while editing the album. Note: The Zoom buttons enable you to increase ( ) or decrease ( ) the size of the pictures thumbnails. 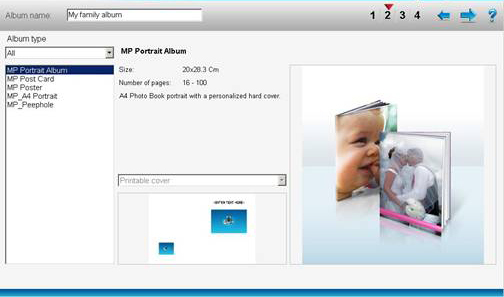 Sample album design - you have to select one of the sample albums provided by the printer. Album I designed – you have to select one of your previous albums. 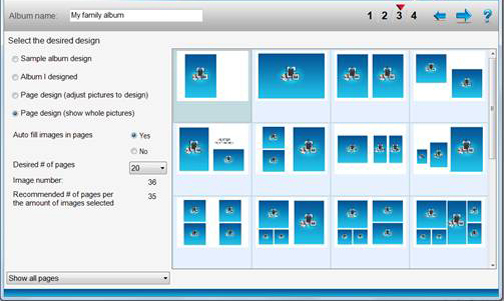 Page design (adjust pictures to design) – you have to select a page layout that will determine the layout for all the new pages in the album. Page design (show whole picture) – you have to select a page layout that will determine the basic layout for all the new pages in the album. The pictures will fully fit into their place holder on the page in such a way that the whole picture is displayed. Choose whether you want the system to “Auto fill images in pages” according to the initial design you selected. By default, the radio button option set to ‘yes’. If you prefer to manually fill in the photos during the edit step select the ‘No’ option. You can change the “Desired # of pages” as you wish; the system will recommend how many pages you should have, based on the number of selected photos and the page design you selected, but still you may select any other number out of the displayed options. 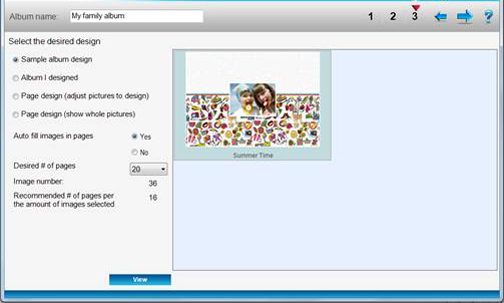 It is recommended to use a sample album to save design time and reach a professional result. So, if you selected for your initial design 'Sample album' or 'Album I designed', this step is the last step in the wizard. If not, the wizard will have one more step. The backgrounds are organized in groups. 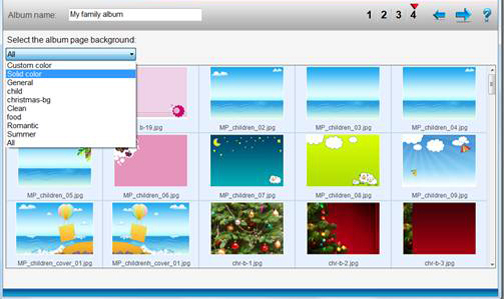 You may select a specific group and select a background picture out of the background list. One of the groups includes list of solid background colors. 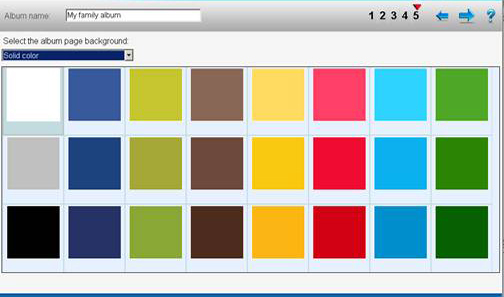 You may also select the Custom colors and it will open a new screen to select a new color. At the end of the wizard, when you click on the button the system will create the basic album according to your selections. This operation may take a while, according to the number of photos and pages in the album. When the album is ready, it will open on the main screen: the photos will be displayed in the photos list (at the right side of the screen), the pages will be displayed on the bottom of the screen, and the selected page in the center. 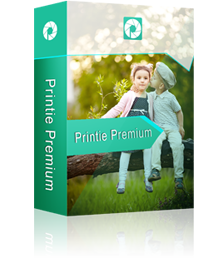 Now you may flip through the pages and start designing the pages one by one. Add meg email címed, hogy értesítést kapj új ajánlatainkról, kedvezményeinkről és akcioinkról! A Digital Color Foto egy Anvico termék. Egy alkalmazás, aminek az a célja, hogy személyesített albumot hozhass létre és aminek te legyél a tervezője. Edris Webdesign © Az Anvico terméke - Minden jog fenntartva.